Kruptos 2 Professional offers a choice of encryption techniques, a thorough file shredder and file protection for phones and tablets. Kruptos 2 Professional costs $35 (there is a free trial version that only lasts for seven days). It is available for Windows Vista and later, and for Mac OS; there is also a free app for Android devices that encrypts but doesn't shred files. The company says its iOS app should be ready soon. Recipients won't need to install Kruptos 2 Pro to open the encrypted file; they'll just need the password. The software took about two minutes to install. The first time you use Kruptos 2 Pro, you choose between always using the same password to encrypt files or entering a new one every time you use it. Kruptos appraises every password's strength with a color bar (green, yellow or red); the password that I used for testing got a yellow warning. The program cannot recover a lost password. It lets you choose between AES with a 256-bit key or the Blowfish algorithm with a 448-bit key. There are a variety of ways you can start the encryption process: You can drop a file or folder into the Kruptos interface; click on the program's Encrypt file button to select an item from the interface's list; or right click on any file or folder in the File Explorer, select Kruptos 2 Professional and click on Encrypt. (Note: In the Mac version, you cannot access the feature by right clicking on files/folders in the Finder.) The resulting file has a .KP2 extension. Kruptos also has a SecureNotes feature that lets you type encrypted notes directly into the program. At any time, Kruptos can create an email with a self-extracting encrypted file attachment. Recipients won't need to install the program to open the encrypted file; they'll just need the password. Kruptos also lets you upload an encrypted file into an online storage service like Dropbox, Google Drive or OneDrive; you can also encrypt a file that is already stored on one of those services. As far as my testing was concerned, this was the encryption speedster, taking 2.7 seconds to encrypt ten files from the desktop and 1.4 seconds to decrypt them. It took 35.5 seconds and 35.2 seconds respectively to encrypt and decrypt the files on a USB thumb drive. When it came to working with the 1.3GB video file, Kruptos encrypted the data in 17.5 seconds and decrypted it in 20.8 seconds. The program's shredder uses the DoD 5220.22M algorithm and can be set to between seven and 23 passes so that it thoroughly wipes a file. With the program set to seven passes, the program took 5.1 seconds to shred the video file. I also tried out the Android version. Its interface is clean and uncluttered, and lets you select files on your phone or tablet for encryption. Kruptos is a one-stop data security center for Windows, Mac OS and Android systems that quickly encrypts data, and an iOS version is on the way. It can make the world a safer place, at least for your data. With three encryption techniques at its disposal, QuickCrypto lets you decide how much security you need for your particular needs. There are three versions to choose from. QuickCrypto - Standard Edition ($19) encrypts and shreds files; QuickCrypto - Professional Edition ($32) promises faster processing and lets you recover deleted files; QuickCrypto - Ultimate Edition ($45 and the one reviewed here) adds password recovery and other features. (Note: Because QuickCrypto is a U.K. company, all prices are approximate depending on the exchange rate.) All editions work with Windows versions from XP to 10. QuickCrypto's eye-catching interface can be tweaked; the program comes with five skins. QuickCrypto lives up to its name -- it took about a minute to download and install. 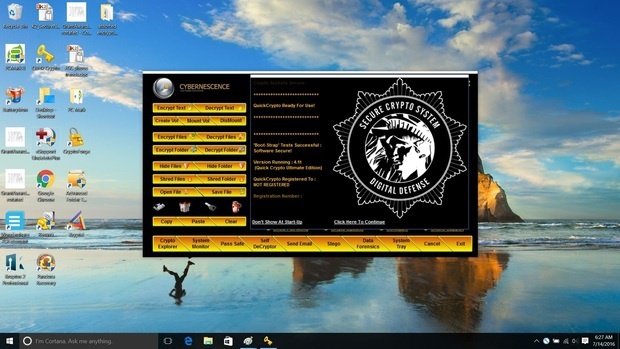 The default black and yellow interface has a prominent sheriff's badge that says "Secure Crypto System -- Digital Defense." It's a little ominous for my tastes, but you can choose from five skins to alter its appearance. It took me a while to learn how to use QuickCrypto, mostly because it doesn't look like any other program I'm familiar with. On the left side is a bunch of tasks, like Encrypt, Decrypt and Shred. In the upper right corner there are two dashes and an "X." As expected, the "X" closes the program and the bottom dash minimizes the window. The upper dash, though, runs the program full screen; I was looking for a square-outline icon to do this. If all that is too off-putting, you can use QuickCrypto to encrypt, decrypt or shred files or folders by right-clicking on them in File Explorer (it can't encrypt an entire disk). The program attaches a .QCE extension to encrypted files. And be careful: It can't recover a lost or forgotten password. In addition to 256-bit AES, QuickCrypto offers 448-bit Blowfish and 168-bit Triple DES encryption. QuickCrypto also has a DoD 5220.22M-compliant shredder that's set for seven passes. When you create a password, QuickCrypto gives its security appraisal; the password I used for all five programs rated a 54 out of 100. Like Kruptos, QuickCrypto can set up an encrypted email attachment, but goes a step further by encrypting the actual message as well. This works only with Outlook, though. There's also an on-screen encrypted keyboard if you suspect a keylogger might have infected your computer. There's a one-click way to lock the workstation and turn off the screen, essentially putting it to sleep: Just click on the shield logo in the interface's upper right corner. The program encrypted my group of ten test files from the desktop in 7 seconds, slower than Kruptos and Kryptel. On the other hand, it was faster than Kryptel at decrypting the file, taking 4.4 seconds. With the files residing on a USB thumb drive, it took 1 minute, 58.2 seconds to encrypt and 1 minute, 15.2 seconds to decrypt, tying with CryptoForge as the slowest. It was also slow to encrypt the 1.3GB video file, taking 36.7 seconds, but fast to decrypt it, taking 13.7 seconds. It took 4.9 seconds to shred it, the fastest of the bunch. 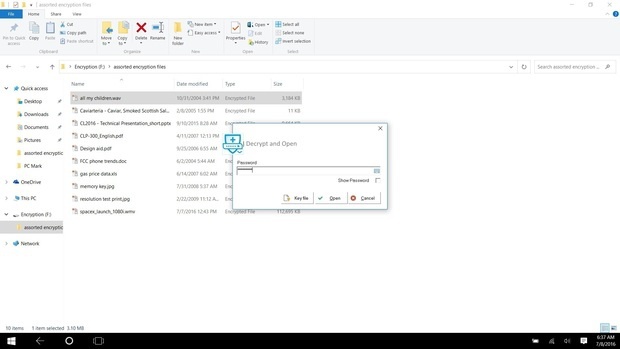 It may not be the fastest overall, provide the most choice as far as encryption techniques goes or look like other Windows programs, but QuickCrypto lets you keep your files and emails safe and secure while providing an encrypted on-screen keyboard. Any of the five encryption programs I looked at can keep your secrets safe and secure or eradicate the things you don't want around anymore on a Windows system. What separates them are their ability to be customized, their speed and how many platforms they run on. CryptoForge offers a good range of encryption techniques and the ability to customize the shredder to up to 99 passes. However, it relies on File Explorer for selecting what to encrypt, decrypt or shred rather than offering its own interface. In addition, it was consistently the slowest of the five. Advanced File Encryption has three levels of security, culminating in full AES encryption with a 256-bit key. It's also one of the only programs to be able to protect an entire drive; however, it's not for those who like to customize their programs. I have to admit to being intrigued by QuickCrypto's eccentric interface, which offers three encryption techniques, but the program takes a while to figure out because it is so different from any other Windows program. Kryptel offers four encryption algorithms and has wizards that make it easy for anyone to encrypt, decrypt or shred a file. Finally, while not perfect, Kruptos 2 Professional comes the closest to my idea of an ideal security program for keeping secrets close to the digital vest. It's the only one of the five that offers a Windows and Mac version; it also has an Android app so you can protect what's on your tablet and phone and the company says it's working on an iOS version. It features the choice of AES or Blowfish encryption, lets you send an email with a self-extracting encrypted email attachment or store encrypted files online. *Total 140MB. In all cases, lower numbers are better.